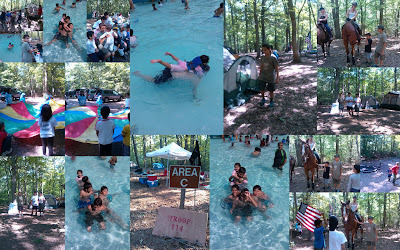 On June 23rd, 2012 Troop and Pack 114 ventured out together for their very first family camping trip. Parents and Scouts alike were testing the waters. For some, it was the very first time ever they had gone out camping. For others, it wasn't the first, but it was the first time that the Scouting program, newly chartered at ICNVT had gone camping. After spending the first part of the morning setting up camp and playing some games, lunch was served. Right after Salaat ul-Dhuhr, all the Scouts and Parents went to the nearby water park for hours of fun. As the day declined and Asr had entered, Scouts and Parents returned to the Camp to find that while they were gone, some small squirrel friends had eaten all the wonderful Whole Grain bread that had been left out completely ignoring the bananas. I guess they were looking for fiber in their diet. A small lesson for the campers that one must secure their food well while in the outdoors. Soon, the stoves were fired up and the smell of delicious meals was all over. The Boy Scout Troop made meals-in-a-foil, cooking over a hot bed of coals. It was all delicious. And to top it off, fresh homemade ice cream made right there and then was served before heading down to the Campfire Amphitheater bit where all had a roaring good time singing songs, listening to ghost stories, and watching skits. Breakfast the next morning was another smorgasbord of foods from around the world. Again, Boy Scout Troop 114 cooked their own meals with first time Grub master leading the way. A Start, Stop, Continue session was conducted where many ideas and lessons were shared. As everyone packed up, it was definitely a trip that will be remembered and loved by all.